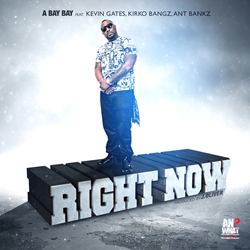 Coast 2 Coast Mixtapes presents the release of the "Right Now" Single by DJ A Bay Bay. This brand new single features appearances by Kevin Gates, Kirko Bangz, and Ant Bankz. You can stream and download this hot track on the Coast 2 Coast Mixtapes website. This is the first single off of DJ A Bay Bay's upcoming album. Representing Shreveport, LA and Dallas, TX, this LA-TEX representative has been on the scene for some time during notable runs with Hurricane Chris naming his song “A Bay Bay’ after him in 2007, being the originator of the ‘Ratchet Movement’ in the South and serving as a popular radio personality on Dallas’ K-104 station weekdays 3-7pm. Bay Bay has truly been on fire as of late. Not only has his new single “Trunk Fulla’ featuring Jim Jones, Dorrough Music & Yo Gotti been making noise on the streets, but the Mayor of his hometown has officially named October 21st “Hollyhood Bay Bay Day” in Shreveport, LA! Additionally, Bay Bay has just signed a new label deal with Rick Ross’ Maybach Music Group! Coast 2 Coast Mixtapes are the most widely distributed mixtapes in the world, with over 100 million downloads/plays generated by over 200 volumes officially hosted by major artists. Coast 2 Coast has a solid reach in the new music industry with a digital magazine, DJ coalition, industry tips blog, yearly convention, and more. Coast 2 Coast Mixtapes represents a unique opportunity for artists of all urban genres, from major to indie. For more information, visit http://www.coast2coastmixtapes.com.